Investigating the sounds that dolphins make, how they use them to communicate and how we can use them to monitor the dolphins. Not all toothed dolphins whistle and Heaviside’s dolphins are one of these – they produce only narrow-band, high frequency (NBHF) clicks. 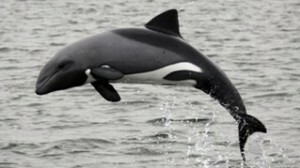 There are only two published accounts of the vocal behaviour of Heaviside’s dolphins, the first of which was written in the 1970s when the recording equipment was not adequate to describe the very high frequencies produced by these animals. From the work of Tadamichi Morishaka and colleagues published in 2011, we know that Heavisideís dolphins produce echolocation clicks with a central frequency around 125 kHz, much higher than the human hearing threshold of 20 kHz. However, this is just the tip of the iceberg and there is still so much to learn about how Heaviside’s dolphins are using their clicks. The NDP is investigating the acoustic behaviour of Heaviside’s dolphins, looking at the structure and production of clicks and linking this with behaviour. Heaviside’s dolphins are one of the more social species in the Cephalorhynchus genus and we are investigating whether certain click types or production patterns are used in social communication. We will also investigate geographic variation in click parameters between our research sites in Namibia and South Africa. As Heaviside’s dolphin often produce echolocation clicks, we can use these naturally occurring vocalisations in Passive Acoustic Monitoring (PAM) to understand the distribution, relative abundance and habitat use of these dolphins. See the sections on the NIMPA project and C-PODS for more information on these projects. Bottlenose dolphins (Tursiops spp.) produce a range of vocalizations, including clicks, buzzes and tonal whistles (Popper 1980). They produce individually distinctive signature whistles, which develop early in life and remain stable for decades. Signature whistles are used by common bottlenose dolphins to remain in contact with each other. They are thought to function in broadcasting individual identity, somewhat similar to a name in human societies. Signature whistles usually range in frequency from 3-27 kHz and travel well through the acoustic environment, transmitting over several kilometres. 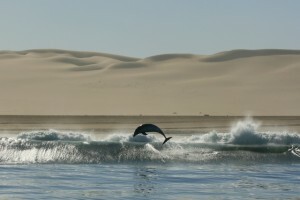 Since 2009 the NDP has been investigating the vocal repertoire of the bottlenose dolphin inhabiting Walvis Bay. In particular, we are interested in describing the signature whistles of this population and testing whether signature whistles can be used in a mark-recapture framework, similar to the individually distinctive dorsal fins used in Photo-ID. We are also interested in linking observed behaviours with novel call types and investigating the functionality of calls produced during different behavioural states such as during foraging or social interaction with conspecifics.